Johnny Depp has been bros with Ryan Adams for a long time, and he played guitar on “Aching For More,” the B-side of Adams’ recent “Gimme Something Good” 7″ single. 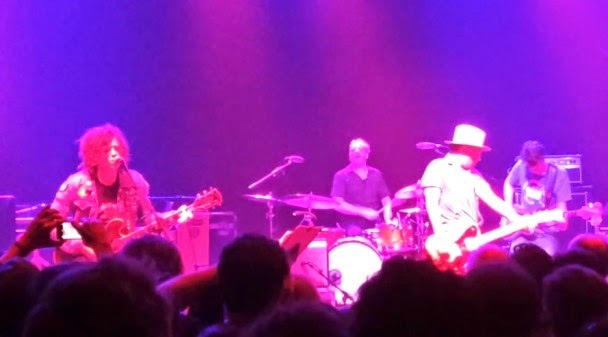 And last night, when Adams and his band played London’s Shepherd’s Bush Empire, Depp joined them onstage to wear a big stupid hat and to play guitar on two songs. One of those songs, improbably enough, was a cover of Danzig’s howling metal classic “Mother.” And I know what you’re thinking: Yes, Johnny Depp did play the John Christ guitar solo, or at least a blusier variation thereof. It was pretty impressive, honestly. Depp also helped out on “Kim,” a song from Adams’ recent self-titled album. It’s been a little while since Depp’s had a hit movie, so it’s good to see that he’s got another career option open to him; I can’t think of any good reason why he couldn’t do this full-time. Watch the fan-made videos below.